We’re hiring a project manager to support our work to protect and preserve community-managed open spaces in Philadelphia. The Land Preservation Project Manager will drive the land assembly process for existing community gardens that are at-risk because of insecure land tenure. Job description and and link to apply can be found here. Welcome to NGT! The Community Garden at Ralph Brooks Park in Point Breeze is the 37th garden to join NGT. An initiative of Connor Barwin’s Make the World Better Foundation, the garden was established in 2015 through the collaborative efforts of Urban Roots, the Pennsylvania Horticultural Society (PHS) and Mural Arts Philadelphia. The garden provides growing space to thirty neighborhood gardeners. 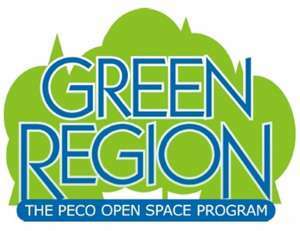 On December 7, 2017, NGT was presented with a $10,000 grant though the PECO Green Region grant program to support land preservation and improvements at five at-risk gardens. 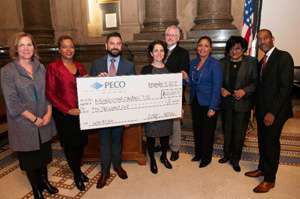 NGT Executive Director Jenny Greenberg joined representatives of PECO, Natural Lands Trust, the facilitator of PECO Green Region, and the Philadelphia City Council to accept the award at Philadelphia City Hall.